Established as a Religious and Charitable trust in 1983 to provide and impart higher Islamic Education to the Muslim Community. On the historical visit of Sheikh-ul-Hadith Moulana Muhammad Zakarriya Kandhelwi (Rahmatullah Alayh) to South Africa in 1981 (1402 A.H), he was requested by some brothers to make Dua for the establishment of a Darul Uloom (higher religious institution) and for the preservation and propagation of Islam. This ignited a spark to turn this dua into reality. A 24 acre plot of agricultural land was purchased by a generous businessman on the outskirts of Lenasia for the establishment of such an institute. Thus 1983 (1404 A.H) saw the institution Darul Uloom Zakariyya becoming a reality which was named after its spiritual mentor. The institution was situated on agricultural land. The suburb of Zakariyya Park came into existence many years later and was named after the institute. Qari Abdul Hamid of Panoli – India served as the first principal of the institute up to 1986. In the first year of operation the institute had a complement of 35 students. Due to the lack of adequate facilities, initially some students took lessons under a tree and the rest were catered for in a large house and two out buildings. The following year saw growth in student enrolment to 100 with six teachers and six classrooms. Prior to the establishment of the first Darul Hadith class in 1991, students usually travelled to the Indo/Pak subcontinent to complete their studies. The first 13 Ulama to qualify from the Institute was in 1991. Due to the absence of a Masjid in the early days, students performed their Salaah in a musallah (prayer hall). On the 16th of February 1992, the Masjid at the Darul Uloom was opened in the presence of many honourable and distinguished guests who travelled from far and wide to attend the opening viz: Mufti Mahmood Hasan Gangohi Sahib (R.A) (former Grand Mufti of Darul Uloom Deoband), Moulana Abdullah Patel Kapodra Sahib (former Rector of Darul Uloom Falah Darain Tarkeshwar), Sheikh Abdul Fattah Abu Ghuddah (R.A) of Syria, who performed the Khatme Bukhari (completion of Sahih al-Bukhari) and Sheikh Ali bin Abdurrahman al- Huzaifi (Imam of Masjid al-Nabawi), who led the first Jumâh Salaah. Mufti Mahmood Hasan Gangohi Sahib (R.A) also performed the first i’tikaf at the Masjid for the entire month of Ramadhaan. During the last ten days of that Ramadhaan, no less than 500 people sat for I’tikaaf, including Sheikh Yunus Saharanpuri Sahib (D.B), Qari Siddeeq Ahmed Bandwi (R.A), Mufti Ahmed Khanpuri Sahib (D.B) and the late Haji Bhai Padia (R.A). A new administration block, Hifzul Qur’an section, kitchen, dinning hall and laundry were constructed with the generous contributions of well wishers over the years. A further 20 acres of adjacent land was donated by a generous brother upon which new boarding facilities were constructed to cater for the ever increasing role of the Darul Uloom. A branch of the Darul Uloom was opened in Eikenhof, a locality some 13km away, in the year 2000, catering for approximately 100 young hifdh learners. 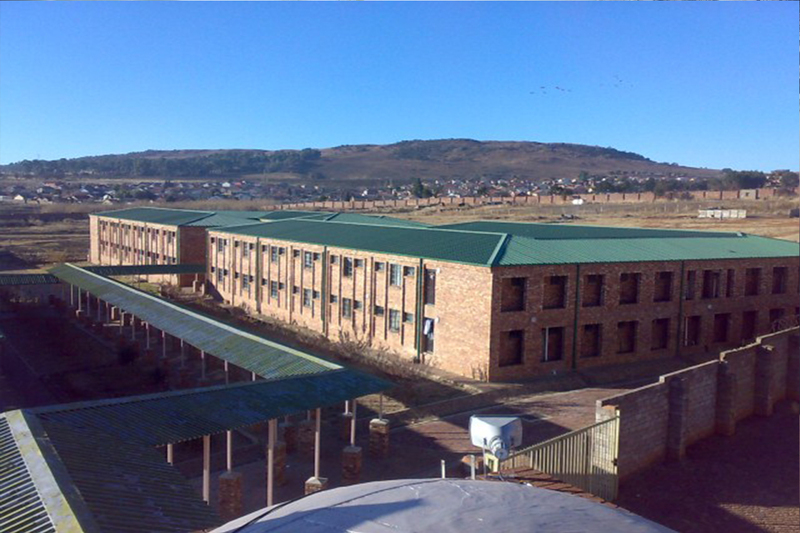 A Maktab has also recently been opened up in Mandane – Soweto, to cater for the religious and welfare needs of the indigenous underprivileged residing there. Since inception, with the tawfiq of Allah Ta’ala, the Darul Uloom has produced just under a thousand Huffadh, 619 Ulama, 137 Qira’aat Sab’ah and 42 Qira’aat Asharah graduates (mid 2011). Mufti Ahmadur Rahman Sahib (R.A), Mufti Wali Hasan Sahib (R.A), Moulana Muhammad Yusuf Ludyanwi Sahib (R.A), Haji Farouq Sahib (R.A), Moulana Umar Palanpuri Sahib (R.A), Moulana Sarfaraz khan Safdar Sahib (R.A), Moulana Idrees Mirathi Sahib (R.A), Qadhi Mujahidul Islam (R.A), Moulana Anthar Shah Kashmiri (R.A), Sheikh Muhammad Bin Abdullah bin Subayyil (President of Haramain Al-Sharifain and Imaam of al-Masjidul Haraam), Sheikh Abdullah bin Umar al-Nasif (former president of the Muslim World League), Sheikh Abdurrahman Al-Sudais, Sheikh Abdulbari Thubaiti, Sheikh Saud Shuraim, Sheikh Salih bin Humaid, Sheikh Salah al-Budair, Sheikh Muhammad Ali Sabuni, Moulana Hakeem Muhammad Akhtar Sahib , Mufti Rafee Uthmani Sahib, Mufti Taqi Uthmani Sahib , Moulana Zulfiqaar Naqshbandi Sahib , Mufti Saeed Palanpuri Sahib, Mufti Azizurrahman Sahib, Moulana Arshad Madani Sahib, Moulana Sayyid Muhammad Rabi Sahib, Moulana Salimullah Khan Sahib, Moulana Farouq Mirathi Sahib, Moulana Abdul Hafiz Makki Sahib, and many more contemporary luminaries, who continue to grace the Darul Uloom with their regular visits. Our dua is that Allah Ta’ala accepts all the efforts put in by one an all, in what ever form it may be, and may he continue to make the Darul Uloom grow from strength to strength. Aamîn. Darul-Uloom-Zakariyya trust to get feedback from the DoHET and the HEQC round June/July 2015 and will start to deliver the new accredited programmes in 2016 upon successful accreditation.